As Clarkson and others have said, you're not a true auto enthusiast until you've owned (or more rightly been owned-by) an Alfa Romeo. Well, today's Nice Price or Crack Pipe Alfetta might just be a cheap way to own up to that enthusiast creed. Usually you'd want to crack open an icy Corona when the weather was warm, and truth be told, the voting on yesterday's Supra Corona ran both hot and cold, eventually ending up being nearly a 50/50 dead heat. Let's see if we can be a little less wishy washy today, m'kay? Alfa Romeo meo meo meo. Oh for heaven's sake, get off your knees and stop groveling. If there's one thing I can't stand it's groveling. You needn't genuflect before the altar of Anonima Lombarda Fabbrica Automobili, they just build cars like any other auto maker. Okay, maybe they're products are a little more engaging. . . perhaps they have a bit more personality, and of course, they possess a lot more soul. But at the end of the day, they're just cars. Irving Stone wrote the definitive biography of another famous Italian - Michelangelo - and titled his work The Agony and the Ecstasy. Perhaps that indefinable soul that permeates Alfa's products is that of the noted sculptor of David's dingle, as that title seems fitting for both artist and Alfa. This 1976 Alfetta GT is steeped in Alfa tradition, sporting as it does a 1,962-cc edition of the company's sweet double overhead cam four. That 115-bhp mill sends its power through a driveshaft employing rubber guibos - ribbed for her pleasure - to the rear-mounted five speed transaxle. The rear discs are also made out of inboardium keeping unsprung weight to a minimum, and making pad replacement something akin to attempting to contain Charlie Sheen's awesomeness. On the downside, it also has SPICA fuel injection - named for all the times uncouth Alfa owners would shout at the mechanic You SPICA de-English? when the finicky fuel injection would break down. And break down they would, with frequency, and occasionally catastrophic effect, as the mechanically-driven pump dumped fuel not into the intake, but the crankcase instead. Webers or Dellortos are the panacea, however. The seller says the car has run, although it was as rich as a Koch brother when it did, and that the transmission shifts okay, a prime reason for his original purchase. But any buyer should still be prepared to spend a weekend or more in making it a driver. Inside it's a little better, and in fact the seller claims it's in GREAT shape, including the unique tach ahead, everything else kind of all over the place dash. The seats are surprisingly intact as is the carpet, although as noted in the ad, it has taken on the unfortunate color of an angry bruise. Also described, and potentially a positive or a negative is the factory A/C which when new was probably about effective as an eskimo's fart in cooling the interior. Outside, things look equally okay - tired but serviceable - and while Michelanglo might turn up his nose at the blue with gold stripes paint scheme, the rest of us probably have less discriminating tastes. Underneath that paint it also looks to be mostly whole. Alfa Romeo didn't invent rust, but they did more to advance its automotive application than nearly any other manufacturer, and this car shows evidence of that effort in its front wing. On the plus side, that just makes the car lighter! 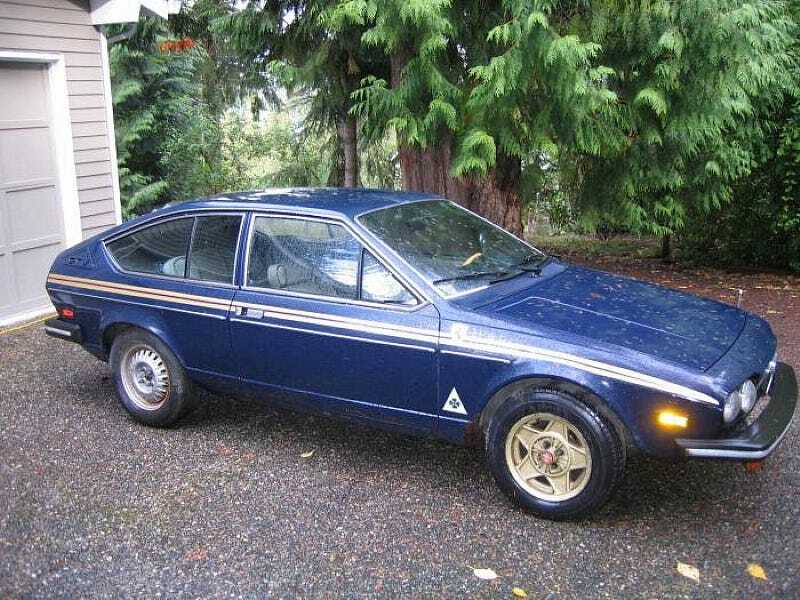 Lightness and speed may be of particular interest with what the potential buyer might just do with this Alfetta GT as its price - $500 - is right in the sweet spot for a LeMons racer or soon to be abandoned and set ablaze robbery getaway car. For the first use allow me to suggest the theme of ‘Alfalfa GT,' named after the gangly Little Rascals character with the perpetual cowlick and Darla Hood hard-on. Alternatively there's always Boba-Fetta for all you Star Wars nerds. What do you get for your five Benjamin's? Well, you're not getting the gold Daytonas, nor the cool C-pillar covers. And for some reason the seller wants to keep the headlights, as though he's one of those Predators and that's his big trophy. Aside from all those, you are getting a proper set of Turbinas and probably a recommendation not to drive it at night. It comes with out title, but with bill of sale from a tow yard auction, although if you're plan would be to race it, who wants to pay the registration? And if you do jones for a little bit of LeMons-ade, what do you think of this little Alfa for the prerequisite and infamous $500? Is that a price that should make someone a true auto enthusiast? Or, does that make for way more agony than ecstasy? Alfa Bulletin Board or go here if the ad disappears.